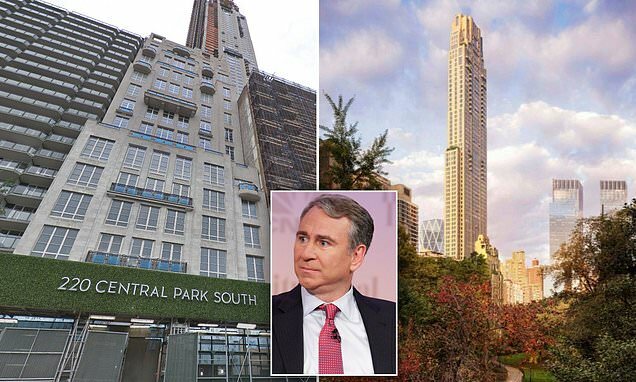 Hedge fund billionaire Ken Griffin has completed the purchase of a penthouse on New York’s Central Park South for $238million - the most ever paid for a home in the United States. The building, 220 Central Park South, is a residential skyscraper that is currently under construction. Developed by Vornado Realty Trust, the building will have 70 floors and a total of 116 residential units by the time construction is completed. The building will stand at 950 feet tall, making it one of the tallest buildings in New York City. It was designed by Robert A.M. Stern, the award-winning architect whose portfolio includes classically styled New York apartment buildings including 15 Central Park West; Philadelphia’s Museum of the American Revolution and the Comcast Center skyscraper; and two residential colleges at Yale University. Griffin, the richest man in Illinois, closed on a penthouse that, once completed, will measure 24,000 square feet, according to The Wall Street Journal. So far, only a handful of apartments in the building have been sold, according to Curbed New York. All of the units that have been sold went for between $12million and $30million. The $238million price tag breaks the previous record for the biggest closing sale in New York City real estate. While Griffin's purchase is the biggest for a home in the U.S., it still lags behind the most expensive home ever sold in the world - a $361million mansion in Hong Kong. The home, which is located in the exclusive neighborhood known as 'The Peak,' was purchased by billionaires Yeung Kin-Man and his wife, Lam Wai Ying, according to Mansion Global. The couple owns a company which sells iPhone screens to Apple.